Photo Caption: Author and television broadcaster Steve Adubato recently met the newest member of the Berkeley College Office of Military and Veterans Affairs (OMVA) – Skyla, a 2-year-old rescue dog. 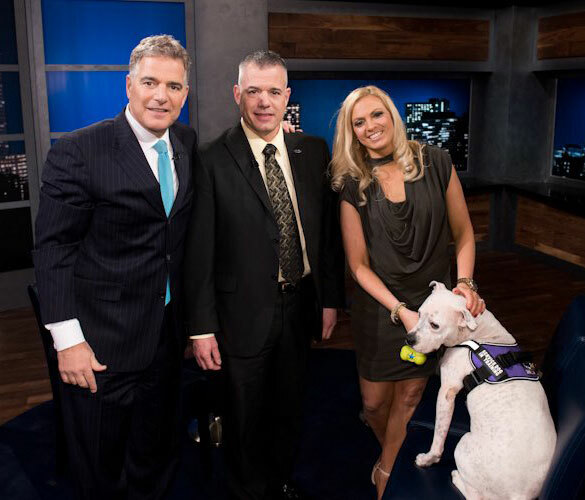 Associates from the OMVA department appeared on the public television program “One-on-One with Steve Adubato” on April 20, 2017, to discuss their efforts in training Skyla as an emotional support animal to assist veterans who suffer from post-traumatic stress disorder, anxiety, depression and/or panic attacks as a result of their experiences while in military service. Click here to watch Skyla and the OMVA department’s appearance on “One-on-One with Steve Adubato,” and click here to learn more about the emotional support dog in training. Pictured above from left to right are Steve Adubato; Richard Robitaille, EdD, Associate Vice President; Tami Pichardo, Director, Veterans Affairs, both of OMVA; and Skyla.